The French have a saying -“Plus les choses changent plus elles restent les mêmes”. In English this means “The more things change; the more they remain the same." Looking through this old newspaper confirms that saying in either language. Now here’s where the French come into it; the headlines are pretty much the same as today's paper. The House was set to vote on Food Relief, seeking $25 million to feed the unemployed. Just like the Great Recession we just had a few years ago. 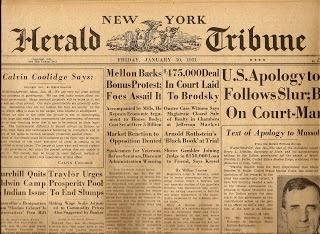 The Secretary of the Treasury was backing payment of the War Bonus to the Veterans of the First World War, which they would never get; similar to the current state of affairs with the VA.
Below the fold is a story about Einstein and his theory on sunspots; and the tiny planet Eros was veering out of its usual orbit and passing the Earth at a distance of 16 million miles. There's your space exploration and Stephen Hawking all in one. On page 3 there is a Coast Guard Cutter capturing a rum runner; an earlier incarnation of today's continuing and unsuccessful War on Drugs. Calvin Coolidge is on the front page, a former President undercutting the presiding one, which was Hoover. That’s about like Jimmy Carter today. The blame for the St. Valentine Day Massacre; barely 2 years old at the time; is laid at the feet of the Chicago Police Department. There’s your Police corruption and drive by shootings neatly packaged for your enjoyment. So, cops and robbers don’t seem to have changed much either. In my old neighborhood apartments were renting for about $35 a month. Stenographers were earning about that for one week’s work. Maids were going for $70 per month; which is about a quarter of what the stenographers made. Wage disparity is still an issue today. The ads are all kind of quaint; advertising the latest in radios and Victrola’s. We have ads for the latest I-phones. Actually, about the only thing that has really changed is the Want Ads. Gone are the various categories for Men and Women. And, there are even ads for “Colored Help”. Wonder what color was cool that year? Must’ve been a shade of white I suppose. Though you don’t see those ads any longer; I have a suspicion that some folks would love to see them again. I love to look at old newspapers - it's such a useful way to look back upon the past and see what; if any; progress we have made. The cars have changed, the technology is advanced; but things are surprisingly the same. Much like this post; which is an expanded version of something I posted on this day 5 years ago. “Plus les choses changent plus elles restent les mêmes”.